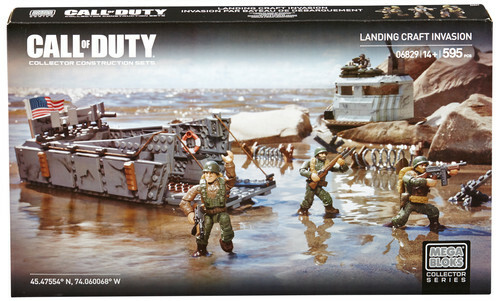 The Landing Craft Invasion features an iconic seagoing vessel used to deliver infantry onto a beach during World War II. This buildable military transport boat measures 9.5 L x 3.5 W x 3.5 H in inches, and is armed with two forward-facing cannons, authentic plate armor and an authentic release ramp that really lowers. Recreate epic war scenes where Allied troops storm the beach, dodge the barbed wire and use the anti-tank obstacles to claim the enemy bunker. The buildable bunker measures 7 L x 4 W x 4.2 H in inches, and is armed with an anti-aircraft cannon. The Landing Craft Invasion includes four extremely poseable micro action figures of Allied troopers and highly detailed, authentic interchangeable accessories and weapons.